Noninvasive image-guided breast brachytherapy (NIBB) is an attractive novel approach to deliver accelerated partial breast irradiation (APBI). Calculations of equivalent uniform dose (EUD) were performed to identify the appropriate APBI dose for this technique. 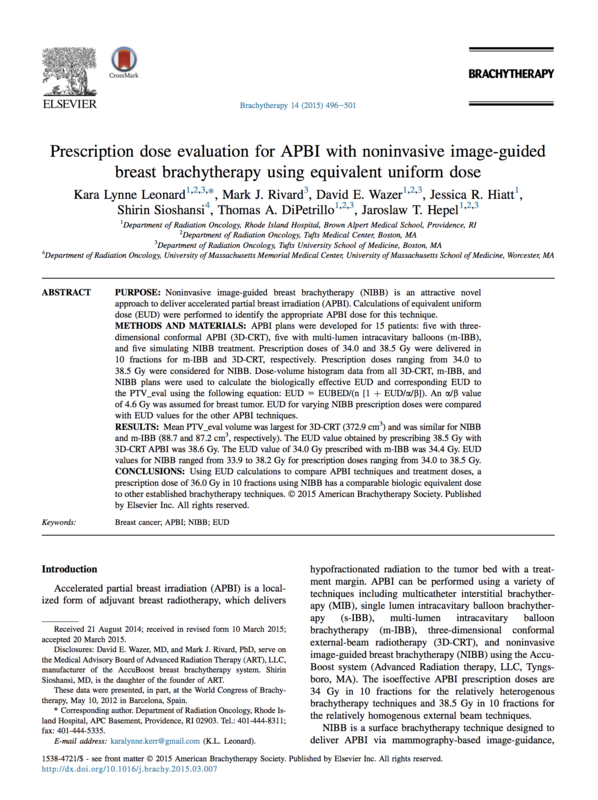 APBI plans were developed for 15 patients: five with three-dimensional conformal APBI (3D-CRT), five with multi-lumen intracavitary balloons (m-IBB), and five simulating NIBB treatment. Prescription doses of 34.0 and 38.5 Gy were delivered in 10 fractions for m-IBB and 3D-CRT, respectively. Prescription doses ranging from 34.0 to 38.5 Gy were considered for NIBB. Dose-volume histogram data from all 3D-CRT, m-IBB, and NIBB plans were used to calculate the biologically effective EUD and corresponding EUD to the PTV_eval using the following equation: EUD 5 EUBED/(n [1 ﬂ EUD/a/b]). An a/b value of 4.6 Gy was assumed for a breast tumor. EUD for varying NIBB prescription doses were compared with EUD values for the other APBI techniques. Mean PTV_eval volume was largest for 3D-CRT (372.9 cm3) and was similar for NIBB and m-IBB (88.7 and 87.2 cm3, respectively). The EUD value obtained by prescribing 38.5 Gy with 3D-CRT APBI was 38.6 Gy. The EUD value of 34.0 Gy prescribed with m-IBB was 34.4 Gy. EUD values for NIBB ranged from 33.9 to 38.2 Gy for prescription doses ranging from 34.0 to 38.5 Gy. Using EUD calculations to compare APBI techniques and treatment doses, a prescription dose of 36.0 Gy in 10 fractions using NIBB has a comparable biologic equivalent dose to other established brachytherapy techniques. 2015 American Brachytherapy Society. Published by Elsevier Inc. All rights reserved.